When choosing new kitchen flooring for your cooking area its always a good idea to make function and durability a priority. There are many options to consider as part of a kitchen remodel and one of the most significant improvements other than with new cabinets is the improved look that can come with new flooring. The variety of beautiful materials and styles can become overwhelming but we can help you pick a perfect fit for your lifestyle and budget. 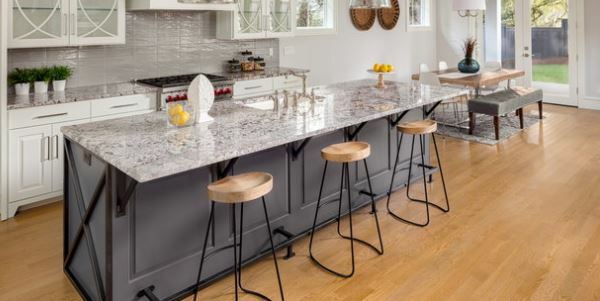 While most kitchen flooring materials are now created with durability in mind, there are also other options that can further add more aesthetic elements to your design without sacrificing their effectiveness and functionality. Concrete: Concrete has a contemporary look and tone that is hard to match. Durable, it can withstand activity in the busiest kitchens and look great. Rubber: Rubber comes in a large variety of colors and textures, comes in large non-adhesive pieces that are inexpensive, durable and non-slip. Stone: Stone may cost more but adds a unique earthy feel while also being very durable and resistant to liquids. Tile: Tile is a very popular option for those with specific designs in mind that can only be accomplished with tiles. Vinyl: Vinyl flooring is very affordable and durable with a variety of textures and styles that are also water-resistant and easy to install. Wood Laminate: Wood laminate flooring is affordable and durable, easy to install and a great choice for more modern kitchen styles. Cork: Cork is a good kitchen flooring idea for a unique texture and a padded feel underfoot and is also good with variable temperatures. Wood: Wood flooring is a classic choice for any home but comes at a cost with upkeep and maintenance as well as potential water damage issues. Bamboo: Bamboo is an excellent eco-friendly option for sustainably sourced materials for your floor. Contact Beckworth LLC for your next kitchen remodeling project including replacement flooring so we can help you upgrade the overall look of your kitchen.